I started quilting in June of 2009, and it's become my passion. I use the Internet as my biggest resource for fabric and ideas. 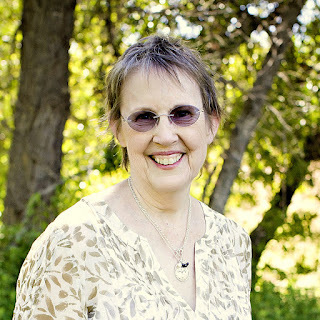 Quilting bloggers are a generous group; sharing tips and ideas. I was crafting jewelry, but find quilting so much more satisfying. I finished 22 quilts this year, and it was hard to choose one to share. I decided to give quilts for birthday gifts this year, instead of Christmas gifts. That way projects are spread out a little more. When I finished this quilt, I told Bob - I'm going to let the girls (our daughters), pick another quilt, if they don't like the one I've made for them. He said, Carrie'd be crazy not to love this quilt. When I posted it on my "Finished Quilts" page, without identifying it's destination; Carrie commented "I love the grays - very beautiful... better hide it when I come to visit! :o)" So, then I fessed-up that it was going home with her, for her birthday. Her birthday isn't until July, but the cat's already out of the bag, so I could tell the tale. Some close-ups. The quilt is measures 45x59" and I called it Tumbled Zig Zag. It was one of my experiments, I don't follow patterns, so most of my quilts are experiments. Be sure to visit Amy, to see what everyone else is showing off. Thank you Amy for hosting this. I loved this quilt when I saw it earlier! The fabrics are gorgeous and I just can't get over how the quilting changes how a zigzag quilt looks! Love those colors! You are certainly on a roll to do some many in such a short period of time! Those colours are beautiful - I'd love to see a photo of it all opened up flat. I love how you made this simple quilt amazing by your quilting! Don't you love when the person you made the quilt for, responds positively. Like love at first sight.For someone new to quilting, you've soared to the top. Thanks for sharing this quilt with us! 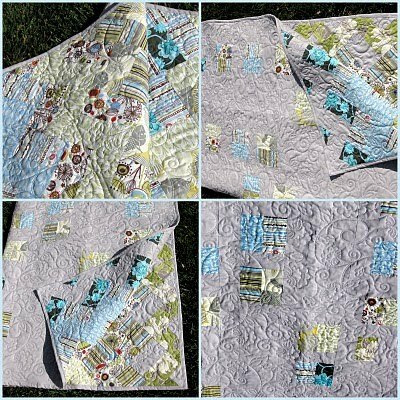 The fabric in this quilt is just gorgeous, and I <3 the quilting! This quilt is lovely however my mouth is still hanging open after I read that you completed 22 quilts in a year! I was patting myself for finishing a wall hanging I started 2 years ago! Jeepers!!! I need to buy whatever it is you take every day. My jaw just dropped at the beautiful quilting! Lovely gift for your daughter! Oh my! I cannot look past the quilting...it is fantastic. 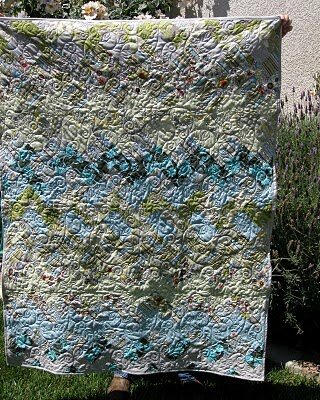 Pretty colors but I LOVE the quilting. this is so pretty and the quilting is amazing. It's beautiful! The quilting is amazing! great quilt! love the colors! Lovely quilt! Colours are classy and the quilting great. 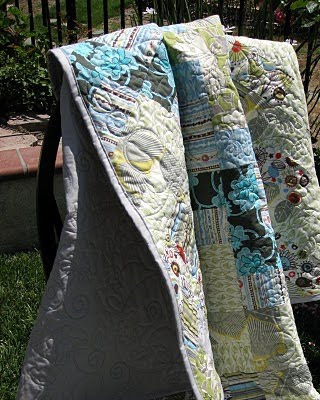 Nice use of the large scale prints- your quilting is beautiful too. Really nice. Love the use of color and pattern. Nice job! I love your quilt! I don't follow patterns much either. Did you quilt this one? Its a fantastic quilt- The colors are soft and you have done a superb job of the quilting. What a great start you have had as a new quilter. 22 quilts is amazing in such a short time. Thanks for sharing your beautiful piece. Such a pretty quilt. I love the fabrics/design/quilting! For someone fairly new to quilting you are really doing some great work. They are great. 22 quilts made in less than a year-amazing. Fun zigzag-lots of them in this festival. Thanks.